Though 15 years have passed since the World Trade Center bombing, the mystery of the circumstances surrounding Dr Sneha Ann Philip’s death has not been unravelled and might remain that way forever. Yet her memory lives on in other ways. George Joseph reports. Dr Sneha Ann Philip would most likely have been a middle-aged physician at some major hospital today. Instead, memories of her froze the day the World Trade Center collapsed. She remains 31-years-old for ever, and her room at her home in Poughkeepsie, New York remains as she had left it. “Sneha’s room has been kept the same way for the past 15 years,” her mother Ansu Philip, a computer professional at the Duchess Community College told Rediff.com. 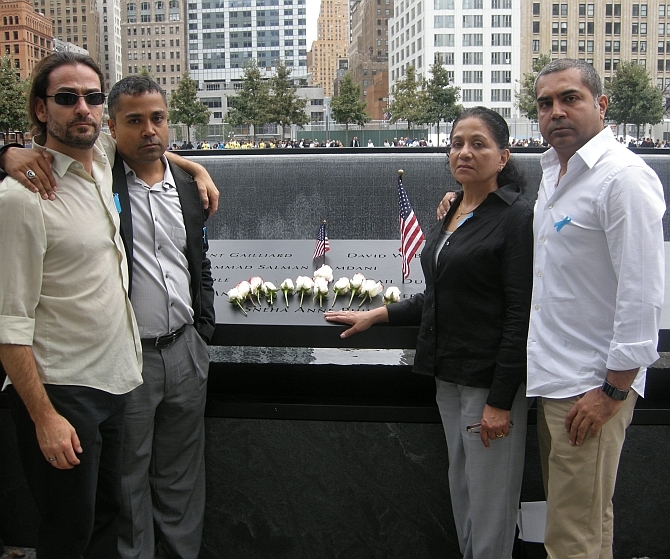 Ansu and her husband, Dr Kochiyil Philip, had no plans to visit the WTC memorial on 9/11, though they would have liked to attend the ceremonies. “Unfortunately, Dr Philip and I are physically unable to walk such a long distance because of the barriers and long path set up for 9/11,” she said. Sneha’s younger brother, Kevin, and his son, Nikhil, were planning to go though. Her older brother, Ashwin, who lives in Miami, attends a local memorial event there, Ansu Philip said. The family also still keeps warm relations with Dr Ron Lieberman, Dr Sneha’s husband, who remarried a decade later, after much persuasion from her family. “Not only do we still keep in touch with Ron, but he makes it a point to visit us at least once every year,” Ansu Philip said. Though 15 years have passed, the mystery of the circumstances surrounding Sneha’s death has not been unravelled and might remain that way forever. Of her last hours on earth, this much is known: On September 10, 2001, a physician doing her residency in internal me­dicine, Sneha was in her Battery Park apartment, not far from WTC, enjoying the start of a three-day break from work. Around 2.30 pm, she and her mother had an extended conversation on instant messenger that, Ansu Philip recalls, meandered through both the interesting and the mundane elements of life, for the better part of two hours. Close to 5 pm, Sneha told her mother she had some errands to run. The security cameras monitoring her apartment show her leaving the building at 5.15 pm, dressed in a short-sleeved brown dress. She walked past the Twin Towers, to Century 21, where she bought some lingerie, a dress, some linens, two pairs of shoes. At 7.18 pm, she checked out her buys, charging $550 to a credit card. Dr Lieberman, who worked then at the Jacobi Hospital in the Bronx, came home around midnight. 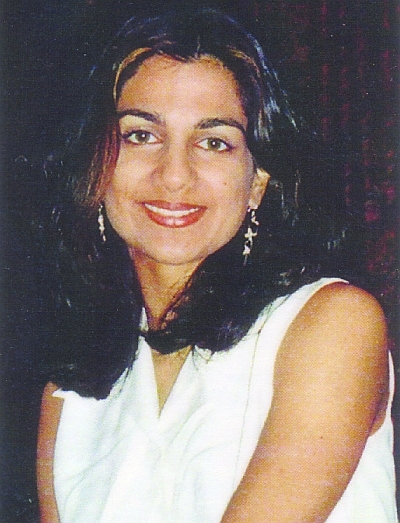 Sneha was not home, but Lieberman thought nothing of it -- she often spent free nights in her brother Kevin's apartment, also two blocks away from the WTC. The investigations by official and private inquiry agencies failed to trace her movements from the time she stepped out of Century 21, until shortly before 8.46 am the next day. The only other sighting of Sneha came from the security camera monitoring her apartment building. Shortly before American Airlines Flight 11 slammed into the North Tower, the camera picked out the image of a woman who looked like her, dressed like her, and moved like her. The glare of the early morning sun made the image hazy, so it was difficult to say for sure -- but Lieberman believes the woman seen in the footage entering the building, walking towards the elevator, pausing for a moment or two, and exiting the building was his missing wife. And then, nothing -- to this day. Initially, Sneha’s parents and husband, did not want her name on the list of victims, thinking she might return one day. She was victim number 2,750 of the terrorist strike. For two years, she was named, honoured, mourned at the annual commemoration event marking the tragedy. Then, abruptly, her name was removed; she was reduced to yet another casual statistic on New York’s crime charts -- a statistic over which loomed an enormous question mark. When her name was taken off the 9/11 honour roll, Ellen Borakove, spokesperson for New York City’s Office of the Chief Medical Examiner, had said the authorities had no tangible evidence linking her death to the WTC tragedy. “Dr Sneha Philip disappeared the day before the tragedy,” Borakove had told Rediff.com then. She had added that the list would be amended, that names, including Sneha’s, would be added if ongoing DNA testing of recovered body parts yielded any evidence. But the family was firm in their belief that just as Sneha entered the building, she learnt of the first strike on the World Trade Center. True to her medical trade, she exited the building and rushed to the WTC, to help if she could. And somehow, somewhere in that chaos, she lost her life, trying to save those of others. Ansu Philip had then also pointed out that only 1,538 of the 2,749 who died there were identified on the basis of DNA evidence. The family went to court, but a single judge had justified the CME’s order. It was only after the appeals court agreed with the family’s claim that Sneha’s name was brought back to the list though the family never did receive compensation. Sneha’s memory lives on in other ways. The Sneha Philip Memorial Fund, which the family instituted, is used for free treatment of patients at the Santhigiri Clinic near Aluva, in Kerala. A plaque, installed at Duchess Community College honours her. And the Mar Thoma Doctor’s Association has instituted a memorial fund in her name.